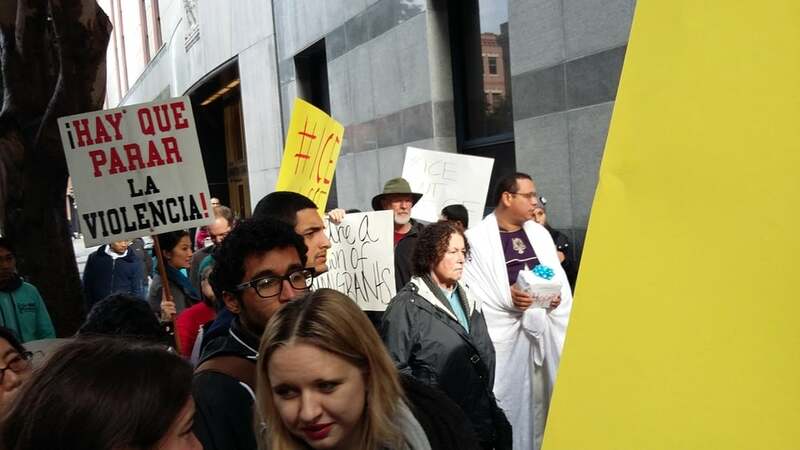 SFILDC attorneys represent unaccompanied minors and families who are in expedited deportation proceedings before the San Francisco Immigration Court, and who would not otherwise be able to afford an attorney. In addition to representing cases in-house, our attorneys provide mentoring and support to pro bono attorneys without substantial immigration experience who volunteer to take on cases. Studies have shown that unrepresented immigrant children are deported at a rate of 90%, whereas, when represented by an attorney, almost 50% immigrant children are permitted to remain in the U.S. when represented by an attorney (Syracuse University TRAC Immigration Project). Since July 2014, there have been over 850 expedited docket hearings at the San Francisco Immigration Court. California receives the second highest numbers of unaccompanied children and families among all the states in the U.S., and the San Francisco Immigration Court has the highest number of families - over 7000 parents and children - on its dockets among all the immigration courts in California. Legal representation makes a 14-fold difference in outcomes, but only half of the families are represented before a judge. As a member of the SFILDC, BASF created a special Attorney of the Day program for the expedited dockets, which is unique throughout the United States. The program seeks to ensure that no child appears before an Immigration Judge and prosecutor without representation. The attorneys also conduct detailed intakes, provide advice, and distribute specialized informational materials to assist these families to find counsel and understand their legal rights. Between March 2015 to February 2016 alone, BASF scheduled over 680 volunteer Attorneys of the Day from the local private immigration bar, law schools, and non-profits. SFILDC attorneys participate regularly in the AOD program, along with other local non-profits and members of the private bar. Through participation in the AOD program, the SFILDC is able to identify San Francisco residents in need of attorneys and match them with an SFILDC organization for full-scope representation. To learn more about the Attorney of the Day Program, visit The Bar Association of San Francisco's website. We strive not only to represent individuals in their immigration cases, but to build power in immigrant communities and advocate for more just immigration law and policy. Schools: We work closely with faculty and staff in the San Francisco Unified School District to identify students and connect students in need of legal services with legal representation. We provide trainings as needed to SFUSD educators about the nature of immigration proceedings for youth and the best ways to support students who are facing deportation. ISAP: Many of our clients are on the Intensive Supervision Appearance Program (ISAP), which involves mandated phone and in-person meetings with supervision officers, stringent curfews and travel restrictions, and electronic ankle monitors that require daily recharging. Though this supervision program, considered an “alternative to detention,” is intended to be a more humane option, we are concerned by the threats that ISAP poses to individuals’ physical and psychological wellbeing. With other local partners, SFILDC is engaged in advoacy on this issue on behalf of its individual clients as well as on a broader basis. San Francisco community members, media, and SFILDC partners gather in front of ICE to speak up against ICE raids after announcement 1/5/16. SFILDC client, Nelly, and Pangea attorneys speak up about the harmful impact of the ICE raids on refugees at rally on Tuesday, Jan. 5, 2016. SFILDC client, Nelly, with daughter, and Pangea attorneys speak up at rally about the harmful impact of ICE raids on Tuesday, January 5, 2016. The SFILDC is dedicated to providing regular trainings and continuing education opportunities in order to build the capacity of legal services providers throughout Northern California. The SFILDC holds monthly roundtables during which attorneys share case strategies and outcomes, raise challenges encountered in their cases, and educate each other about valuable medical, psychological, and social services available to clients. The Immigrant Legal Resource Center and Center for Gender and Refugee Studies also hold regular trainings tailored to the legal needs of this population. CGRS provides critical training and technical assistance focused on asylum law. The trainings are tailored and responsive to SFILDC needs and the technical assistance services provide case-specific guidance and in-depth mentoring. CGRS shares its extensive expertise on child asylum and gender asylum, sending attorneys litigation materials specific to their case—including but not limited to legal “road maps” for representing children’s asylum claims, sample briefs, and materials to help build the evidentiary record, such as hard-to-obtain expert declarations. CGRS also provides one-on-one legal consultations to help attorneys brainstorm legal strategy and resolve difficult case issues. ILRC experts have provided free introductory and advanced trainings on a range of different topics specific to deportation defense and issues on the surge dockets. The ILRC has responded to hundreds of individual questions through the SFILDC listserve and the ILRC’s Attorney of the Day program, through which a panel of expert attorneys at ILRC provide advice on a variety of issues that have arisen in cases. In particular, ILRC has played a leadership role in educating attorneys and state courts about Special Immigrant Juvenile Status (SIJS), a primary and critical path to legal status for children in the U.S. SIJS presents a specialized intersection of state child welfare laws with immigration laws that is unfamiliar to many immigration attorneys. The ILRC has also prepared extensive written materials and advisories for attorneys on the special remedies available for immigrant children and youth.